Dr. Mario: Miracle Cure came as quite a surprise. 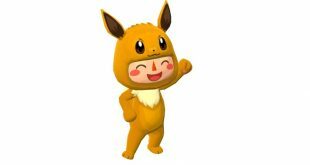 It was announced and released in Japan on May 31, and it finally hit the eShop in North America and Europe on June 11. 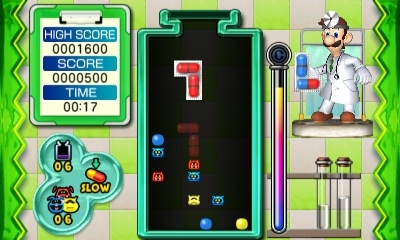 By bringing classic Dr. Mario gameplay together with elements from Dr. Luigi and Dr. Mario Online Rx, Miracle Cure provides an excellent Dr. Mario experience for a low price. If you’ve never played a Dr. Mario game, the concept is pretty easy to grasp: your job is to get rid of red, blue, and yellow viruses. You can do this by manipulating colored capsules that continually fall into the field. 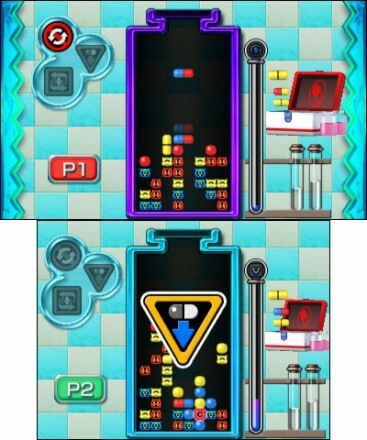 It’s very similar to Tetris, really, except with just a few differences that make the game unique. Dr. Mario: Miracle Cure continues with this same formula, but adds a new element – the miracle cure. As you match colors and eradicate viruses, a meter on the side of the bottle (your playing field) fills up. When the meter is full, you’ll be given a random power-up called a miracle cure. Miracle cures have several functions: one is a bomb that destroys capsules and viruses in the immediately surrounding area (shown above), another clears an entire row or column, and yet another clears all capsules and viruses of a given color. Along with the miracle cures, the L-shaped capsules introduced in 2013’s Wii U exclusive Dr. Luigi make an appearance in the new 3DS title (shown above). The touch-screen focused Virus Buster mode first seen in Dr. Mario Online Rx also makes a comeback (shown below). Both of the modes look and feel great on the 3DS. The 3D effect isn’t used anywhere other than the main menu, but the game still looks great. Unfortunately, the option to customize the game music that has been present in almost every other Dr. Mario game isn’t present in Miracle Cure. The music tracks are randomly selected for each level. The tracks are still good, but not being able to choose your own music definitely detracts from the Dr. Mario experience. As far as gameplay goes, Dr. Mario: Miracle Cure is the series at its best. The sixty levels in the Miracle Cure Laboratory are a great way to get started, even though they’re short lived. After an hour or two with the Laboratory challenges, you’ll be ready to take on the rest of the game – Custom Clinic mode and multiplayer. 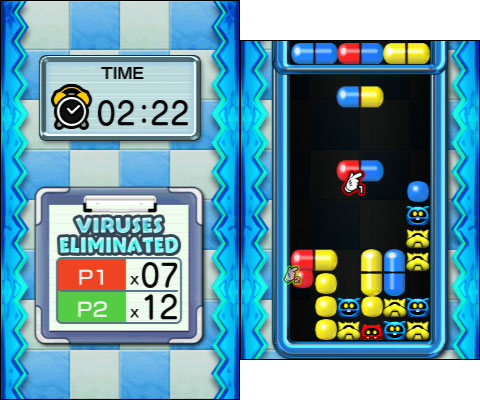 In Custom Clinic, you’ll be able to choose between Dr. Mario, Dr. Luigi, and Virus Buster gameplay. 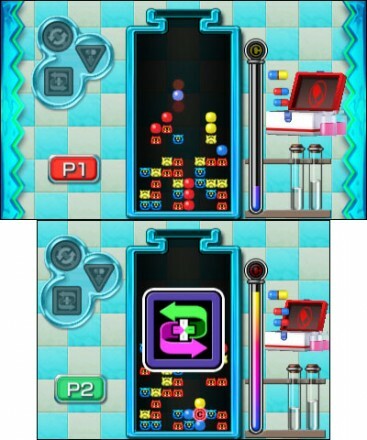 You can choose to play with or without the miracle cure power-ups, and both the Dr. Mario and Dr. Luigi modes offer either endless single player gameplay or the option to play against a CPU. Virus Buster only offers endless single player gameplay without the miracle cure power-ups, but it’s still a ton of fun. 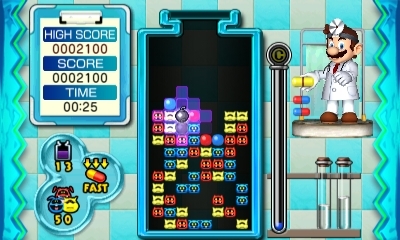 Though puzzle games don’t usually focus on multiplayer, Dr. Mario: Miracle Cure continues the intense multiplayer tradition that previous entries started. During multiplayer, miracle cures aren’t just power-ups – special miracle cures cause problems for your opponent. Reversing the effects of the directional pad, preventing your opponent from rotating capsules, and increasing drop speed all make each multiplayer match especially intense. Even when miracle cures are turned off (which is an option for both Dr. Mario and Dr. Luigi multiplayer matches), the multiplayer is absolutely insane. The high-speed gameplay is incredibly addicting, and the multiplayer element makes it even better. During my time with the game, I lost far more matches than I won – but I thoroughly enjoyed every single victory and defeat. 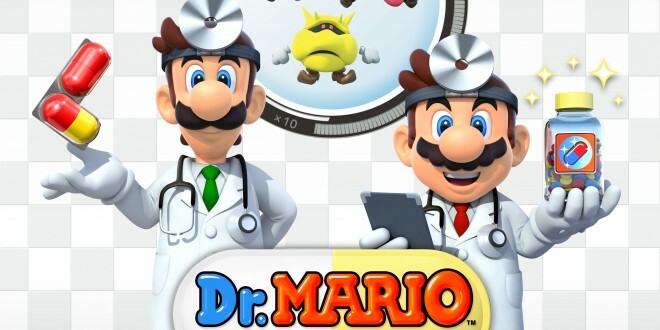 By bringing the Dr. Mario, Dr. Luigi, and Virus Buster modes to Nintendo 3DS along with an excellent online and local multiplayer system (including download play), Dr. Mario: Miracle Cure manages to be the best of the three Dr. Mario titles available on 3DS. Not only that, but Miracle Cure just might be the most definitive Dr. Mario experience currently available. Even though it doesn’t change things up too much, Dr. Mario: Miracle Cure brings together the best of the series to create a truly awesome puzzler for a low price. By bringing together the best of the series, Miracle Cure manages to provide a definitive Dr. Mario experience for a low price.